When Windows freezes it usually happens for one single application or process taking up all the cycles of the CPU thereby denying other running processes their share of the CPU. The result is that the whole of Windows and all applications become unresponsive and we say that the computer has frozen. One offending application can bring the whole system down because there is no way of monitoring and restricting how much CPU cycle a particular application can consume. Process Lasso is an application that aims to solve this issue. Process Lasso is a unique new technology intended to automatically adjust the allocation of CPU cycles so that system responsiveness is improved in high-load situations. It does this by dynamically temporarily lowering the priorities of processes that are consuming too many CPU cycles, there-by giving other processes a chance to run if they are in need. This is useful for both single and multi-core processors. In addition, Process Lasso offers capabilities such as default process priorities, default process CPU affinities, termination of disallowed processes, and logging of processes executed. With Process Lasso you essentially create rules to manage processes running on your system. - Make notepad.exe run at below normal priority each time its launched. 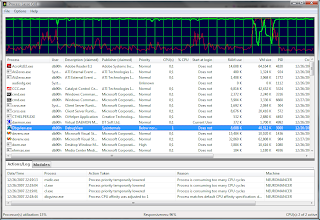 - Make firefox.exe run only on CPU #1 each time its launched. - When any process is consuming 35% or greater of the CPU for 1.5 seconds or more and the total system CPU usage is 95% or greater, lower that process's priority until it returns to 5% CPU utilization. One extremely useful feature of Process Lasso is that it allows you to assign CPU affinity to a program permanently. I have been looking for a program that does this for months.